In order to proactively respond to the Belt and Road Initiative and advance China’s education along with the Belt and Road Initiative, CQUPT signed a strategic cooperation agreement with China-ASEAN Information Harbor Co., Ltd. in the morning on April 28. To serve for the construction of the “Information Silk Road”, the two parties will work to push forward cooperation on cultivating international information technology talents, scientific research coordination, and innovation and entrepreneurship education, and participate in the task of building “China-ASEAN Information Harbor” with ten ASEAN countries. At the meeting between President Li Lin, CQUPT, and Lu Dongliang, Chairman of China-ASEAN Information Harbor Co., Ltd. and his delegation, the two parties exchanged their opinions on cooperation including professional personnel cultivation, scientific research, etc. Subsequently, the two parties signed a strategic cooperation agreement and promised to make full use of their resource advantages of professional personnel, teachers, scientific research and internationalization to cooperate on scientific innovation and results transformation in such fields as big data, intelligent manufacturing, Internet of Things, and cloud computing. That is how both parties can provide professional personnel cultivation and professional training for the personnel of communication industry in ten ASEAN countries and play a positive role in building the “Information Silk Road”. According to the requirements of the Belt and Road Initiative, China and ten ASEAN countries including Myanmar, Indonesia and Malaysia reached an initiative to build China-ASEAN Information Harbor together in the first China-ASEAN Cyberspace Forum in 2014. The initiative covered the construction of five platforms including infrastructure, technological cooperation, economic and trade service, information sharing and cultural exchange. In April 2016, the State Council approved to establish China-ASEAN Information Harbor Co., Ltd. which served as a platform to build and operate China-ASEAN Information Harbor and implement key projects. The services provided by the company include system integration and equipment manufacturing related to communication and information businesses. In order to facilitate economic, social, technological and cultural exchange between China and ASEAN countries, the company stays committed to recruiting top talents, bringing in advanced technologies and cultivating superior abilities, and it aims to make China-ASEAN Information Harbor a core communication hub and an information industry base which centers Guangxi Province, covers southwestern and south-central China and targets ASEAN countries by establishing a Internet Plus ecological circle. 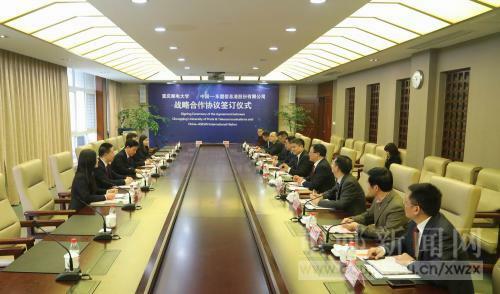 CQUPT and China-ASEAN Information Harbor Co., Ltd. held a meeting. President Li Lin and Vice President Liu Yanbin met the delegation of China-ASEAN Information Harbor Co., Ltd.
On 11th April, Jean-Francois Perno, the senior consultant of Thales and Paul Salvatore, International Marketing Vice-President of communications and security and their delegation came to our University for exchanges., Vice President Liu Yanbin and the relevant functional departments attended the meeting. Vice President Liu Yanbin greeted to all the guests. Liu firstly extended a warm welcome to them and then did a brief introduction to the recent development and construction of our university. Jean-Francois Perno gave a detailed introduction to Thales in several aspects such as its background, its development, its organization structure, investment projects, talents management mechanism and so on, in the hope of cooperating with a best partner in Chongqing. Directors of our related functional departments communicated with the guests in terms of our university’s scientific research and automation industry development and so on. Two parties had a detailed communication and shared on the specific work and late possible investment cooperation projects. On a field trip, Jean-Francois Perno and his delegation visited Chongqing Industrial IOT International Cooperation Base, Chongqing Industrial IOT Collaborative Innovation Center, Chongqing Research Center of Automobile Electronic Control and Embedded Systems Engineering, and Chongqing Self-owned Brand Automobile Collaborative Innovation Center. They highly praised the efforts and achievements made by our university in terms of scientific and technological innovation and application. On April 5, Dr. Chen Honggang, Vice President of Kavout Corporation Global Business Development of the United States, visited CQUPT at our invitation and gave an academic report to all students and faculty in an academic hall in Shaw Building, themed “Applying financial technology to improve financial quotient and put entrepreneurship into practice”. At the meeting, Chen Honggang, through the change of Wall Street and the rise of financial technology, detailed the current application of financial technology frontier companies and financial technology, especially Kavout Corporation, as a start-up the typical case, which has achieved intelligent stock picking and scientific prediction through its application of AI technology innovation, big data analysis, deep learning, data mining and other technologies into scientific and quantitative analysis of financial data, as well as application of non-linear algorithm into quantitative risk analysis and prediction. Currently, it has showed sucn a significant trend that its global financial layout changed due to financial technology represented by artificial intelligence and big data. Chen also explained to them how to use financial technology to improve financial quotient and financial management, and put theoretical knowledge into innovation and entrepreneurship practices. Vice President Fu Mingqiu met with Dr. Chen before the meeting. The two parties had an in-depth discussion on school-enterprise cooperation, scientific research, international exchanges and cooperation, education and training in innovation and entrepreneurship and other aspects, and carried out extensive exchanges about further carrying out scientific research cooperation and personnel training in future. Fu Mingqiu hopes that via this visit, Vice President Chen Honggang can guide and help our university to carry out R&D in financial big data and business intelligence, build close academic exchanges in relevant fields between two parties, and promote our ability to transform science & technology innovation and achievements. Dr. Chen is now the Vice President of Global Business Development in Kavout Corporation, responsible for the company’s business expansion and strategic partnership. He is a former software testing director and a manager of US Microsoft headquarter with over 30 years of computer-related work experience.